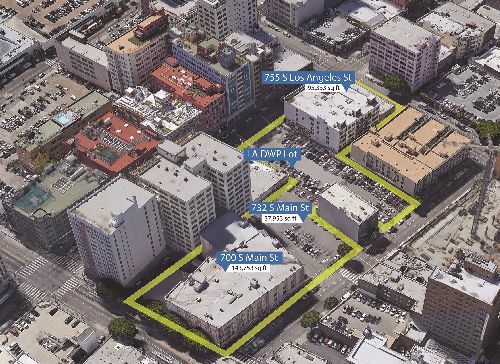 ESI Ventures recently acquired three downtown Los Angeles properties to develop a mixed-use creative office campus in the area’s vibrant Fashion District. ESI’s plan is to create a large, walkable campus with ground-floor retail, large floorplate creative office spaces, tenant amenities and a highly desirable rooftop restaurant/bar concept. The acquisitions consist of: 755 S. Los Angeles Street, a 100k sf commercial building on 18k sf of land; 700 S. Main Street, a 138k sf building; and 732 S. Main, a 38k sf parcel of land. ESI acquired 755 S. Los Angeles St and 700 S. Main St in partnership with Urban Offerings, a Los Angeles based development firm that specializes in creative office and mixed-use developments. The excess land at 732 S. Main Street, which ESI purchased on its own, will be used as parking, but presents another real opportunity for future development. The six-story building at 755 S. Los Angeles St, formerly the historic Norton Building used for manufacturing, has 16.4k sf open floorplates and 11’ clear height ceilings that are ideal for creative office use. ESI and Urban Offerings are developing a ground floor food hall, four floors of office, and a rooftop restaurant concept that will contribute a combined 60k sf of offices and nearly 43k sf of shops and restaurants to the area. The unique four-story building at 700 S. Main St, formerly a Deardens department store, features 27k sf floorplates, 14’ tall ceilings and a basement with useable space that may be turned into a speakeasy. Once renovated, this building will feature 18k sf of ground floor retail and 100k sf of creative office. Andrew Turf of CBRE has been awarded the retail leasing for the project, while Lee & Associates is handling the office leasing. Improvements for 755 S. Los Angeles are underway and scheduled to be complete by Q4 2018. The renovation at 700 S. Main St. will commence shortly and is scheduled for completion in Q4 2019.